Firstly, the scale of it is on another level! The Bell Centre is a 21,000+ seater arena, a hell of a lot bigger than any hockey arena we have in the EIHL, and I’ll be honest, we went cheap and we’re sat in the gods, 6 rows from the back wall at around 20,000ft up! But do you know what, it didn’t matter that I’m used to watching from Door 14, five rows back from the plexi in the SSE Arena – the spectacle was all there to see. 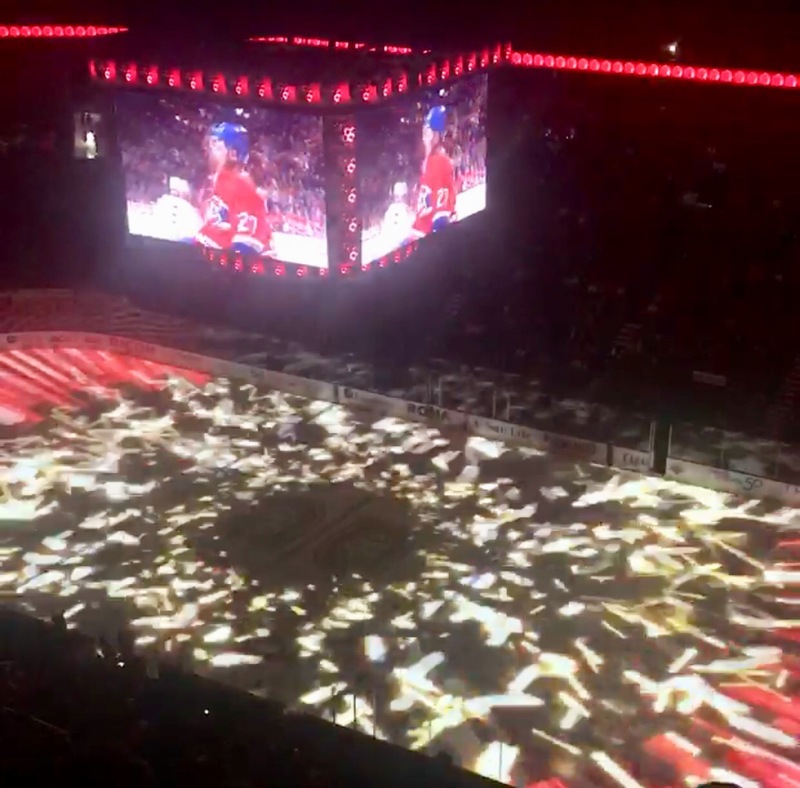 The light show to start with was amazing, so engaging and in fact as Habs players faces are shown, it almost gave rise to the biggest cheers of the night (there wasn’t much else for the home crowd to cheer all night to be fair!). The Habs entrance fanfare gave rise to the biggest cheers of the night from the crowd and kept my Kate on the edge of her seat, even if the game didn’t! Secondly, game day in Montreal. Jerseys everywhere: Habs, Kings, even a Belfast Giant one! Bars are packed around the arena, flags (flegs) are everywhere and almost every other window has a team sticker in it. This is Hockey for the masses, and even better, other games are on TVs in bars around the city. This isn’t hockey like I know it, this is a religion here to the masses, not just we proud few like it is back home. They even have statues to their heroes of hockey! Quick photo op with the Rocket Richard! The game itself was engaging, but unfortunately for the home fans, it was for all the wrong reasons. The LA Kings arrived to Montreal with netminder Jonathan Quick celebrating his 500th career NHL game, and I’m sure it will be one he will remember, as he stood tall over the 60 minutes and kept a clean sheet against a lacklustre Canadiens side that never really looked like they worried him at all. Not surprisingly then, he was the first star of the game, but more than that, and likely a reflection of the Habs performance, all three stars were Kings! Certainly there was no risk of Carey Price being on that list after a shocking display between the pipes and a massively lacking showing from the Habs D-core. Not a great game when all’s said and done then, but do you know what – I couldn’t have cared less, because I still loved it, and I got to see former Nashville Predators and now Canadiens stalwart Shea Webber, something I’ve wanted to do for years. Let me tell you, you can feel the force behind that slap shot of his from WAY up in the stands when he lets rip! The best part of the night though? Has to be being spotted by a roaming arena cameraman who came and sat beside me after spotting my Belfast Giants jersey from a few sections over and asking who they were and from where before warning us to “get your camera ready, you’re gonna be on the big screen”! Definitely something I’ll never forget, so long as nothing more awesome happens tonight at the Senators v Canadiens here in Ottawa! All in all, I’ve got to say that I absolutely loved the game in Montreal, but sure that’s what we all say about our first time, right? At least until the next time! « Episode 15 – Puppy Power!